HIGHLIGHTS Includes an exclusive Menu Builder for restaurants Includes an awesome and exclusive Garnish Slider Supports WooCommerce for .. Create your own menu fast and easy! This 8.5×11 Food Truck Menu Flyer with bleed space is easy to personalize and adding your own information, .. 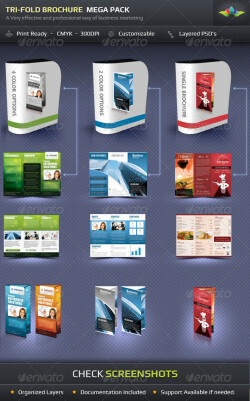 This Tri-Fold Brochure Mega-Pack includes Corporate Tri-Fold Brochure in 4 color options Corporate Business Blue Tri-Fold Brochure with .. 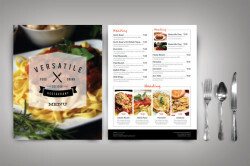 Description This Hotel Menu Brochure was built to ensure easy file editing: colors and text are easily customizable, paragraph styles are properly ..
Professional Tri-fold restaurant brochure / menu template. 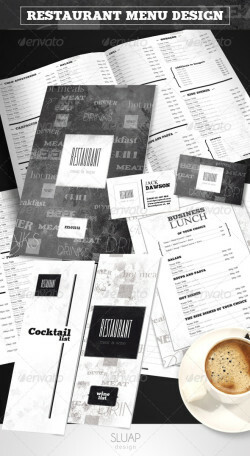 beige – brown design that features a detailed paper texture, brushed headings ..
“Mexican menu template” suitable for any ethnic cafe business or related to restaurant business. Menu has been created using tables ..
Trifold Brochure Template is 8.5 by 11 in (8.75 in by 11.25 in with bleeds) and is ready for print, because it’s in CMYK at 300 dpi. The psd file .. Perfect for fresh bars, Fast Food Restaurants, Burger snack bars etc. 2 different sizes with bleeds Size 8,5×11 and 4×6 Easy to change ..
01_Menu (bifold) – 2PSDs – A3 – 11,69×16,54” + 0,25” bleed-300dpi 02_Wine List (bifold) – 2PSDs – A4 – 8,27×11,69” + 0,25” ..